Clinical Document Architecture (CDA) is an HL7 document markup standard that specifies the structure and semantics of "clinical documents" for the purpose of exchange. CDA documents derive their machine processable meaning from the HL7 Reference Information Model (RIM) and use the HL7 Version 3 Data Types. 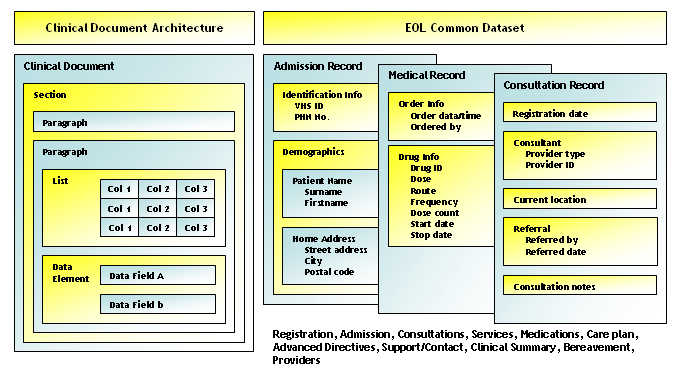 CDA is a flexible XML-based clinical document architecture. CDA itself is not a specific document, but can be used to express many types of documents. A CDA document can contain many data sections, all of which contain narrative text, and some of which contain structured data elements, some of which are coded. There are many types of CDA documents, including CCD, XDS-MS Discharge Summary (HITSP C48), History and Physical (HITSP C84), Lab Report (HITSP C37), etc.